Thanks so much to Anne Boleyn Files visitor, Gillian, for passing this information on to me. Gillian wrote to the National Portrait Gallery concerning the famous portrait of Anne Boleyn which is usually on display there but which was missing on her recent visit. The National Portrait gallery replied to Gillian’s query, stating that the painting had been undergoing a 9 week period of analysis as part of the “Making Art in Tudor Britain” project and that it had been found that the portrait is in need of urgent conservation work. The bad news is that the painting will not be on display for visitors to the NPG at the moment BUT there is some interesting news. The analysis undertaken by the experts has confirmed that the painting is late 16th century and so was painted not long after Anne’s lifetime, suggesting that it could be a good likeness in that it was painted within living memory. Further interesting news is that the famous NPG Catherine of Aragon portrait is NOT a contemporary painting but, in fact, only dates back to the early 17th century. The NPG experts found that the blue paint used for the background and in the jewels in Catherine’s hood contained Prussian Blue, a pigment which was not invented until 1704-1710. This finding was also backed up by tree ring analysis on the wood used for the panel, which dated the panel to the early 18th century at the earliest. 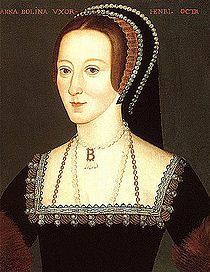 and various engravings thought to be of Anne Boleyn. Thanks so much for this, Claire 🙂 This is exciting–I have confidence in my favorite portrait of Anne!! Also, next time I go to London (yes, I am across the pond, but love it and plan to go within the next year or two) I will definitely visit the National Portrait Gallery and bring your list with me. Interesting also about Catherine of Aragon’s portrait; I assumed it was contemporary. Oh no! When will Anne’s portrait be back in place? I am visiting in September and the portrait gallery is one of the places on my list! I don’t know, Heather, they just said that it was undergoing some conservation work. Their telephone number is +44 (0) 20 7306 0055 and the email is archiveenquiry@npg.org.uk if you want to check whether it will be on display on the date you are visiting. Of course, I spent quite a lot of time in front of Anne’s portrait… It was a great experience! I am happy to find out that it is almost contemporary, so taking this into consideration as well as Elizabeth’s ring, I can bring myself to imagine how Anne really looked like! I went to the National Gallery last week (its not called the portrait gallery anymore) and they had hardly any of these paintings up, infact I don’t remember seeing any of them! I was quite disappointed. The most interesting ones I found were the Two Ambassadors portrait and the execution of Lady Jane Grey. I was last at the NPG in 2005 — a few years after they opened the official Tudor gallery — and I remember standing in that room and drinking in all those images I knew from my books. (I can’t remember at the time if the portrait of Katherine Parr had been identified as being her or if it was still being labelled as Lady Jane Grey). My favorite — Elizabeth’s coronation portrait 🙂 The one painting I wish WAS there was the teenaged Elizabeth portrait (the one of her in the pink), which is another fave of mine, but unless something has changed, it’s probably still hanging in that chamber at WIndsor Castle (saw that one back in 2000, no thanks to my stupid tour guide who was rushing us through. I looked back over my shoulder, saw it and starting walking AGAINST the crowds to see it). But it was so nice being close to all those wonderful portraits. Though I agree this is interesting stuff, it is sadly not that new. The NPG has stated for a while now that the Katherine of Aragon portrait is as late as the C17th and that the Anne Boleyn portrait is probably Elizabethan, thus C16th. The sitter’s box for Anne Boleyn contains a wide range of images of portraits of her [including some in private collections]. I’ve posted a few on my Flickr page. Many follow the NPG pattern. The archive is free to enter, but its best to book appointments beforehand. Just to add – I think there is the potential for a study on Elizabethan images of Anne Boleyn. There have been discussions on Anne’s treatment in literature from late C16th onwards, but little on representations of her (namely under her daughter). But the countless portraits of Anne dating late C16th and shortly after needs exploring. If I wasn’t busy with my stupid dissertation, I would love to look at that! The NPG have only just updated their website to reflect the Catherine of Aragon portrait information so it’s about time that that information was in the public domain. It is funny how the portraits keep being identified as different people. I’ve always thought that the second Catherine portrait you mention was more in keeping with the other Catherine of A portraits so I’m glad that it’s thought to be her again. I know there are still arguments raging about the Catherine Parr/Lady Jane Grey one and also the Catherine Howard one. Very true, Nasim, that would be fascinating to look into. I just wish that the full length portrait of Anne Boleyn that the Earl of Romney is said to have could be shown to the public, I’d love to see it. It seems the NPG failed to update all their information at once. They changed the labels inside the gallery and added some more details in the sitter’s box in the archive (which was very surprising given that the boxes can be quite disorderly!) I’m surprised that they didn’t update their website before doing that. As many individuals cannot get to the NPG and rely on their site, they should post new information at the first moment they can. I’m currently watching one portrait [once claimed to be of Mary Tudor] that the MET are examining and the lack of updates on their site is annoying! The Katherine of Aragon/once believed to be Katherine Parr portrait is interestingly as for many years it was determined to be of the first wife; the dress also matched this figure. I don’t know why it changed. Susan James’s definitive study of Katherine Parr, mentions the portrait as being of her subject though I don’t know whether she was the first one to advance this. James was the historian who argued for the Jane Grey portrait being of Parr and certainly produced a very convincing casefor this. 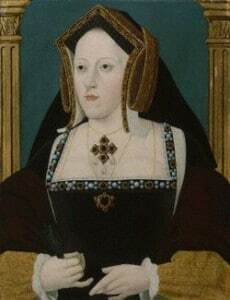 But the other portrait is almost certainly of Katherine of Aragon. Thanks for the post Claire, I’ve been wondering about NPG analysis ever since G W Bernard mentioned it in his book on Anne. Interesting about the Catherine of Aragon portrait – I’ve always assumed it was relatively contemporary. I went to the NPG last time I was in London (1997!) and got to see most of their Tudor portraits apart from the Catherine Parr one as they were in the process of re-identifying it, having previously thought it to be Lady Jane Grey. I was a little bummed out by that as I always thought of it as Lady Jane and was the one (aside from Anne) that I most wanted to see! Oh and the best time to go to the NPG is early in the morning – I went just as it opened and for a while it seemed I was the only one there. Being alone in the quiet with all my favourite Tudors was fantastic, not to mention slightly spooky! btw my husband is in for a telling off haha! I think the key word about this information is “confirmed”. It had been thought that the NPG Anne was 16th century, but they have now proved this and that is what I found exciting. The Catherine of Aragon portrait I have so many times read of as being contemporary and to be told it is confirmed as 18th century, was most unexpected. The gallery told me that they would be puting a label by the Catherine portrait , giving information on their most significant findings from the study. They also said they would put information about their findings on the two portraits on their web site, but this would be unlikely to be until early next year. Gillian has just let me know that the NPG do not know when the Anne Boleyn portrait will be back on display. It could be off display for the rest of the year and the conservation work may have to wait until the next financial year, i.e. after April. Not good news for those who wanted to see it but it’s important to conserve it for the future. I pray its on display next July !!! believes it to be of the doomed fifth queen, but I really disagree. more likely to be of her than this. But is it Elizabeth Cromwell? family, but in the 1540s. Last week I went to the National Gallery in hopes of viewing Anne Boleyn but to my dissappointment a little note was left saying she’s down for retouches and after reading this post it looks as though she’d been down for almost a year! !